Often described as Africa's fastest growing city, Botswana's capital Gaborone is a vibrant and colourful city, which lies in the flat valley between Kg ale and Audio hills, on the Not wane River in the south eastern corner of Botswana, 15km from the South African border post at Truckling. 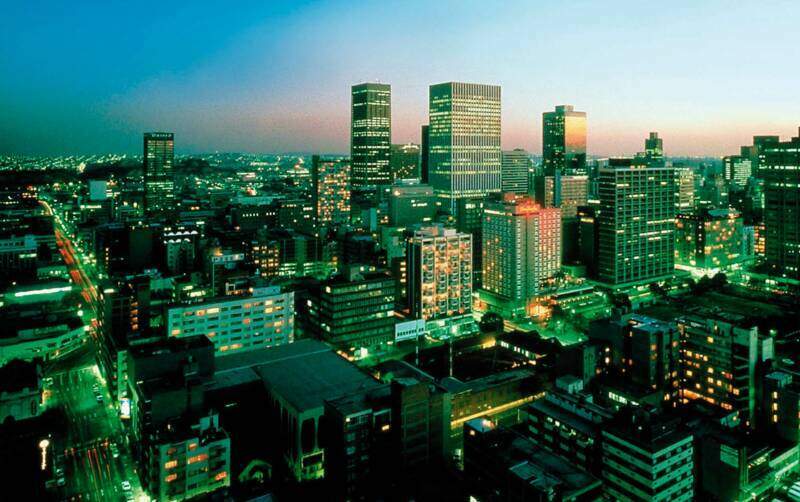 In 1998 Gaborone had an estimated population of 192,000 inhabitants. 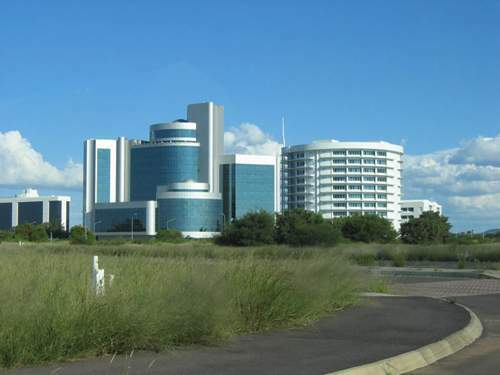 As the capital city, Gaborone is the seat of government as well as the country's commercial and administrative heart. The city is named after Goosy (Chief) Gaborone who led the Bottleneck tribe into the area in the 1880s. They settled in Truckling, the first urban area you reach when driving into the city from the South African border post 10km to the east. In the early 1890s a colonial fort was built in an area now known as The Village near Truckling, and its ruins can still be seen near the Village Cinema. As plans developed for Bechuanaland's independence, the need to establish an administrative town within the boundaries of the country was recognized. Bechuanaland was the only territory in the world whose administrative centre, Mafeking, lay outside its boundaries. Nine possible sites had been suggested: Ma ha lap ye, Shush, Francis town, Serowe, Artesian, Lob at se, Gaborone, Maun and a point within the Tali Block. Gaborone was chosen because of its strategic location, its proximity to the railway line and Pretoria, its already established administrative offices, its accessibility to most of the major tribes, its non-association with any particular tribe, and, most importantly, its closeness to a major water source. In three short years, the new capital emerged from the African bush. By the time it was completed, it boasted Assembly buildings, Government office blocks, a power station, a hospital, schools, a radio station, a telephone exchange, police stations, a post office, banks, shops, a church, a hotel, a brewery, a stadium grandstand and more than 1,000 houses. The basic infrastructure was in place for Independence Day on 30 September 1966, when Bechuanaland became the eleventh British dependency in Africa to become independent. Today it is a very different story, and Gaborone is a bustling modern city, and the seat of power for one of Africa's most successful economies, which once again is being viewed with envy by almost all her neighbors. There are numerous busy shopping malls offering full range of imported and locally produced goods, excellent restaurants, top international quality hotels, sports clubs and various night clubs. New buildings and suburbs sprout like mushrooms wherever there's a block of land to fit them, resulting in a mix of low-cost housing, blocks of flats, shopping centres and industrial complexes. Government ministries, the National Assembly, the House of Chiefs and the Archives are all grouped in the Government Enclave. The University of Botswana, the National Museum and Art Gallery, as well as the stadium and a golf course are also located here. In late 1998 a couple of private commercial radio stations, Yarona FM and Gabbiest were established in Gaborone, and in conjunction with the government's RB2 radio station, have provided a great forum for the expansion and development of local musical talent, which at last is seeing steady growth. On the August 30th, 2000 the first national television service called Botswana Television (BTV) was launched. 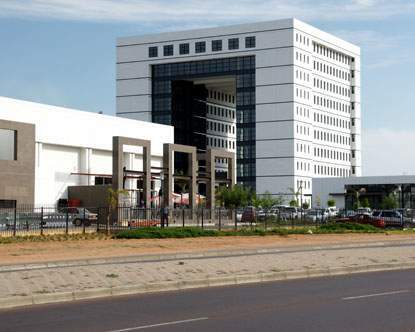 With the headquarters in Gaborone, it is the first station in Africa to fully utilize digital technology. The signal of BTV is also carried on a PAS7 satellite with a footprint that covers the majority of the continent. Botswana International Trade Fair held in the city is an annual event. Football matches and cultural gatherings are frequent occurrences at the National Stadium, while music and drama are performed at a number of venues, including Mai ti song Cultural Centre. Situated close to the capital, Sir Seretse Khama International Airport has modern facilities to cater for all wide-body aircraft and has recently installed state-of-the-art radar facilities aimed at enhancing the safety of flights in Botswana airspace. Visitors to Gaborone now have an excellent choice of 'craft' shops to choose from. Botswana Craft, which specializes in crafts from Botswana, has several outlets in the city. The Camp hill charity shop stocks good handmade wooden furniture and various other craft items such as local pottery and weaving. At Audio weavers, 5km north of Phakalane, visitors can tour the weaving factory and shop, while in Breadfruits the Craft Workshop houses a range of very upmarket craft outlets which is becoming exceptionally popular with Gaborone's cappuccino drinking set. For day trippers from Gaborone, just 5 or 6km north of Mutually on the Francis town road lies 'Meetings Footprints', one of Botswana's few 'Creation' archeological sites. 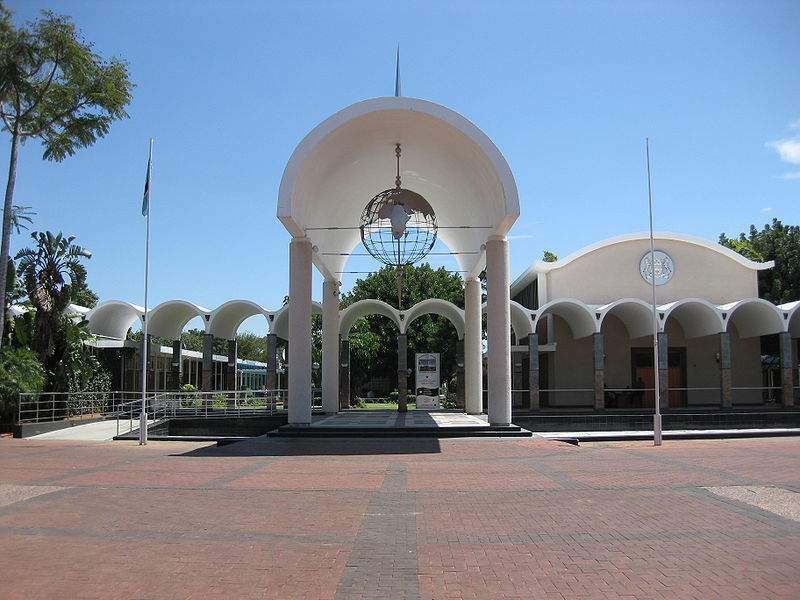 The Main Mall is the starting point for your journey around Gaborone. This area was planned in 1963, in a preparation for the Independence and was to be the town centre, located between the Railway Station and the Army Garrison. Today it is the heart of Gaborone with shops, banks, business offices, as well as walkway with people selling crafts and other goods. At the eastern end of The Mall is the Civic Centre that also houses a public reference library. Opposite the Civic Centre is the Pula Arch, a landmark that commemorates the Independence of Botswana. The National Assembly is at the top of the Main Mall where it is surrounded by the other tall government buildings. At the centre of this government enclave is a paved square with a War Memorial in memory of the 300 Bats wan a who died fighting with the Allies against Fascism in the Second World War, 1939 to 1945. 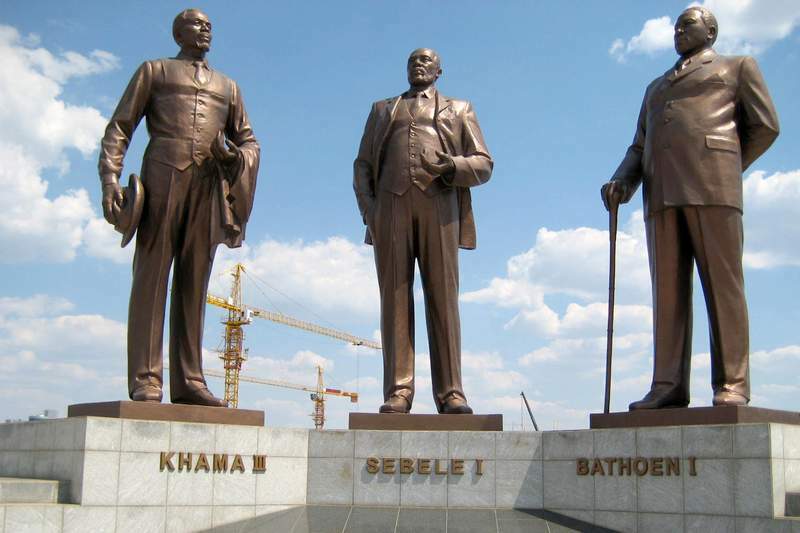 There is also a statue of Sir Seretse Khama, Botswana's first President. Some 2km south of the Main Mall the National Sports Stadium, the Gaborone Golf Club, the Cricket Club, the Rugby Club and the Botswana Tennis Association Courts are located. Tennis Association Courts hosted the international Davis Cup competition in 1997. There are numerous gymnasiums throughout the city and the main hotels all have good in-house gym and health club facilities. A second golf course has also recently been completed in Phakalane, and offers excellent club house facilities and a well-designed course set in landscaped woodland, edged with prime residential properties. See the map. Kg ale Hill dominates Gaborone on the western edge of the city. 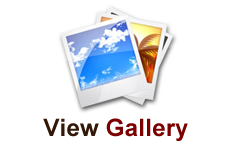 It offers a pleasant climb with breathtaking views of the Dam and city. Visitors can choose one of three well-defined routes up the hill: the steep Rusty's Route up the rocky face; the longer Transfeldt Trail up the back; and the undulating walk across the saddle to Cross Kopje. Each takes less than an hour. There is a resident troop of baboons living on Kgale and a pair of black eagles consistently nests in the craggy cliff-face just below the peak. There have also been reports of early morning sightings of leopard. While lions are the major attraction, the St Claire Lion Park has a great deal more to offer. Set in open woodland 14km from Gaborone on the Lobatse road, a variety of outdoor activities are offered for the family, making it a favourite haunt of the "Gaborone 4x4 Club" and a relaxing spot for weekend picnics and getaways. 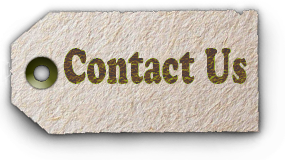 An entrance fee is charged, and facilities include a restaurant, bar, extensive children's playground, horse trails, motorbike rides, a vulture restaurant (where Otse's Cape vultures are fed), three dams, game viewing, picnic sites and the camping grounds. The park is open every day, but the bar and restaurant are closed on Mondays.